Walking is okay, but why not get a kick scooter for adults and add a little excitement to the mix? Kick scooters got their name from the way they are maneuvered. A rider needs to kick the ground as they move along. The scooters do not have a battery or even an engine. They are only able to work, since they are propelled by the rider. When they were first introduced in the market, they were initially popular with kids. However, kick scooters are now available for everyone. The best kick scooters for adults will provide you with a whole world of convenience. One of the advantages that scooters have is the fact that they don’t any specific set of skills. There are no professional requirements needed in order to ride them. With a little practice, one could easily ride them. You won’t get frustrated when handling them. 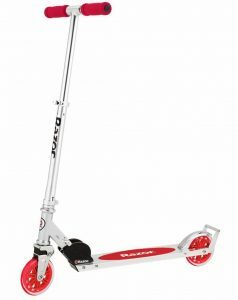 The best kick scooters are faster to move around in compared to walking. In some places, people use them as their preferred means of transportation. They are used for getting to the market, to even going to work. The weight limit of the scooter: There are many kick scooters available in the market. To get one that’s suited for you, you need to check that your weight is within the scooter’s weight capacity. This way you will be able to fully enjoy your scooter experience. The wheels of the kick scooter: Wheels are important because they will determine how smooth your ride will be. If the terrain will be an issue, ensure you get wheels that are sturdy and tough. A higher rated A wheel, will last longer and better handle weighty riders. The scooter deck: The deck is a crucial part of a scooter. A lightweight deck, will give you an easier time to carry it around. The size of the deck also matters, since you need to fit comfortably while riding. Your kick scooter experience, largely depends on the kind of deck you will choose. Make sure that it will not wear out quickly and it will provide you with enough grip. The handlebar: Make sure that you choose one with the proper height requirements for you. This way you will not strain yourself when riding. Additionally, the scooter’s handlebar should be easy to adjust as well. Kids, teens and adults can all use this kick scooter. Such scooters can easily be shared among individuals of the same households. The kick scooter was designed with shock absorbing features. This is thanks to the front wheel’s capability to absorb vibrations. As a result, your ride will be as comfortable as ever. The company offers you guaranteed longevity with this scooter. It is able to accommodate up to 100kg and happens to be very sturdy. 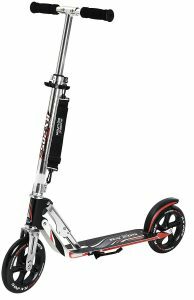 The kick scooter for adults has a deck that measures about 510mmX113mm. It also has a 370mm handlebar which is easy-grip, and an ABEC-7 Carbon Steel Bearing. The scooter weighs about 5.37kg in total, making it easy to carry around. Your purchase will come with a 3 year warranty and a 90-day money back policy. Hudora used the highest quality aluminum, to make this kick scooter for adults. Weighing just 4 kg, it is one of the lightest scooters in the market. For high elastic wear resistance, the kick scooter was made with big 250mm PU wheels. You won’t feel vibrations and bumps while riding. This is also due to the fact that, the handle is wrapped by a soft sponge. The quality you get from this purchase is guaranteed. It will not be prone to rust and is very durable. When you buy this scooter, you’ll get a free one year warranty. 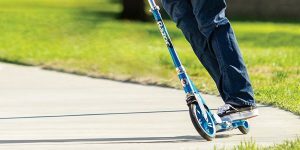 Micro Kickboard has one of the most appealing kick scooters for adults on this list. The scooter is Swiss-designed and will definitely capture everyone’s attention. It was built to last, and has quite the solid construction. This is why you won’t experience any shaking or rattling, when you ride on it. The kick scooter was designed in a way that each one of its part is replaceable. This is advantageous because, you won’t have to take on the cost of replacing the entire scooter. For a smooth ride, they were designed with highest quality polyurethane wheels. It can be used by anyone who is above 8 years old. Kick scooters for adults are more beneficial if you can use them anywhere. This particular one can even be used off-road. The scooter is more stable and rigid, thanks to its triple stacked head-tube clamp. You will be impressed by its tubular BMX style steel fork. The tires used on it are 200mm, and have an aggressive tread pattern. Such kinds of tires are made for the purpose of tackling dirt. The kick scooter has a full deck, which also has coarse grip tape. You will feel absolutely confident whenever you ride this. To make this kick scooter portable, it was designed with adjustable handlebars. This will give you an easier time, since you’ll just to fold it down and carry it. It was designed with a sparking mechanism which is foot controlled. This kick scooter for adults also has LED lights. The lights are motion detected and run under the deck. This is definitely a fun scooter option. Aircraft-grade aluminum was used to make the scooter’s deck and tube. Because of this it’s light and long lasting. You will also get a refillable spark cartridge with your purchase. Razor will always surpass people’s expectations. 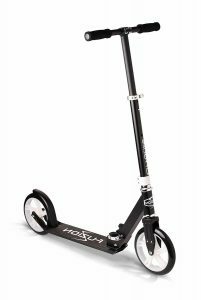 This kick scooter for adults is one of the best in the market. This is because it was designed by professional riders, who also tested it. That is why its performance is way above average. Lightweight aircraft-grade aluminum was used to make it. The scooter was also constructed with a double-stacked head tube clamp. The end result of such a combination is durability and added strength. The wheels used are urethane and 98mm in size. The wheels are also equipped with ABEC-5 high-speed bearings. When you are heavy, finding the right scooter can be challenging at times. This scooter option is capable of supporting up to 220lbs of weight. Despite it being the ideal kick scooter for adults, it has been designed to be used by people of all ages. The riding height is very comfortable and it has a low deck structure. To make your ride more stable, the scooter uses oversized polyurethane tires. 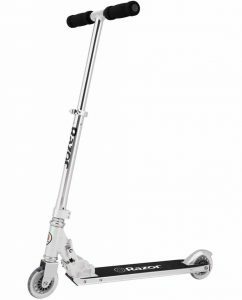 Razor presents you the original kick scooter. The design of the deck and t-tube are even patented. 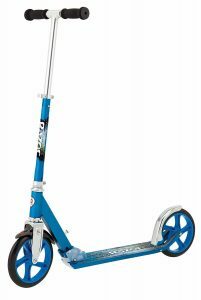 The scooter uses a spring less shock system with its 98 mm inline-style, urethane wheels. The wheelie bar is also new, and the scooter can be folded whenever you need to carry it. 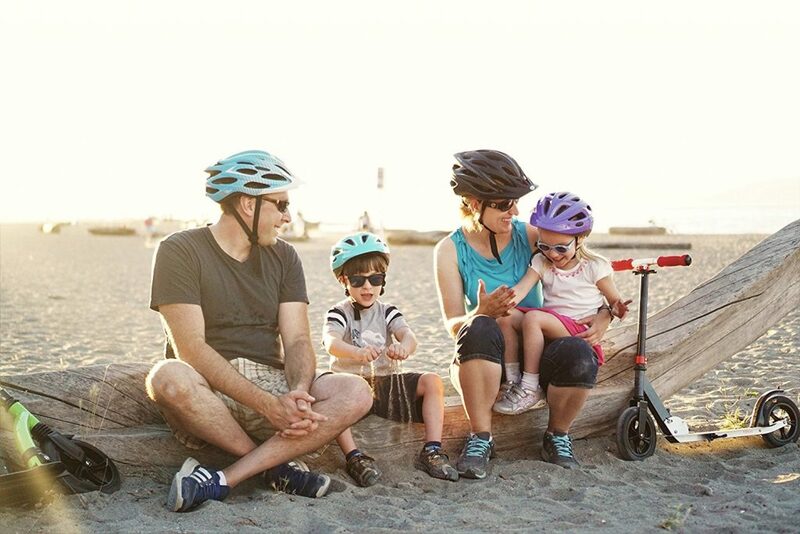 To easily make quick stops, the kick scooter has a patented rear fender brake. 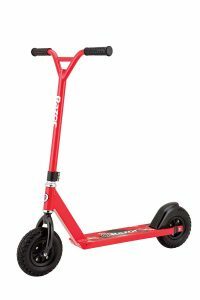 Riders who intend to use this kick scooter, should at least be 5 years old and above. This is one sturdy and reliable purchase. The maximum weight capacity of this scooter is 143lbs. 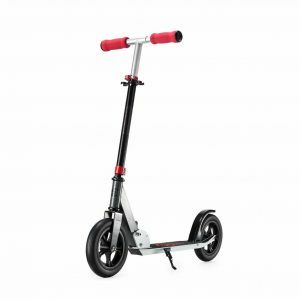 This kick scooter for adults comes in a total of 4 colors. The colors are blue, black, green and red. It is a classic design, made using aircraft-grade aluminum. Although it has the same shock absorbing system as the previous option, the two scooters have their differences. Razor has managed to secure several top positions on this review. Their reputation and quality products are unbeatable. 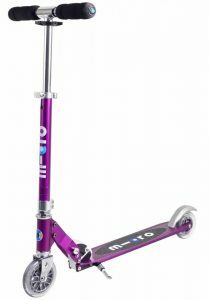 The Razor A5 Lux Scooter has an anodized finish and kick stand. 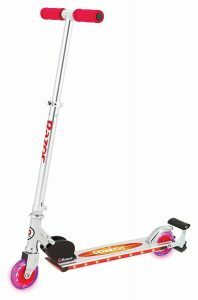 It is the ideal kick scooter for adults, for individuals who are taller than most people. When assembled the scooter measures about 35″ L x 21″ W x 41″ H. That is why it is able to comfortably accommodate tall people when adjusted. Not only is it strong, but the scooter is also very user friendly. The wheels are extra-large and made of urethane. 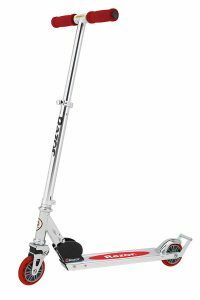 In this Top 10 Best Kick Scooters for Adults list, we have provided scooter options for different weight limits. Our options also consist of scooters that can handle different types of terrain. The list will be of benefit to both new users and professionals alike.